I’ve been dealing with pumpkins this week, and the stores are overflowing with them. I have lots of pumpkin puree in my fridge and freezer, so I found a way to use some of it, and I’m sharing it with you. Cook up that zucca and make this for dinner! With many thanks to the Italian Food Net, which presents this cooking lesson in Italian with English subtitles. Now be honest, can you cook this way? I’m distracted in so many ways–the Italian language in my ear, conversion from metric to whatever my ‘normal’ is called, the impossibly clean kitchen, and the friendly and attractive Italian chef who wants to help me cook up something delicious. Aside from looking up recipes, have you learned to cook something by watching video instructions online? 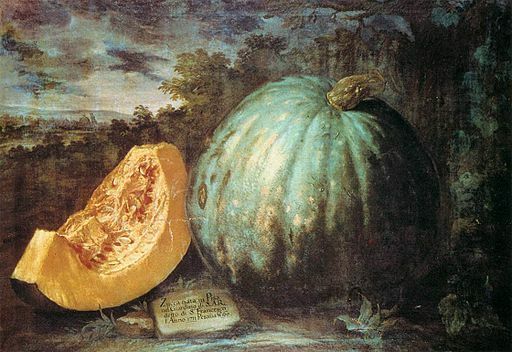 This entry was posted in Food, Italian, Language and tagged Bartolomeo Bimbi, food, Italian food net, pumpkin, ravioli, zucca. Bookmark the permalink. I actually really don’t like to use the videos because you have to stop and start them. I like watching cooking programmes but it’s just pure escapism especially when you have to do something boring like ironing – if I have to actually follow a recipe give me a written one every time!